Be Bold. Be Passionate. Be Unforgettable. Are you confused about how to shop for LuLaRoe? 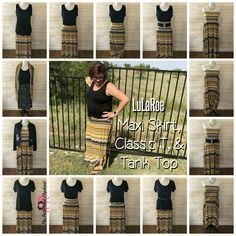 If you’re familiar with LuLaRoe, then you probably know that every LuLaRoe retailer is different. Not only do we have the wonderful ability to carry the styles and sizes of our choice, but we all have the flexibility to run our business the way that works for us. Some retailers choose to do in person pop ups only. Some rely strictly on their Facebook group. (Some don’t even have a Facebook group!!) 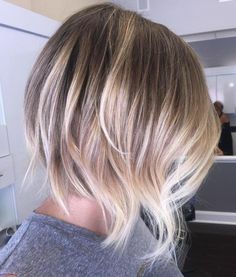 Then within their group, some retailers hold album sales, some do live sales, some do styling sessions…the list goes on and on. It’s one of the many reasons I enjoy my job; I get to make my LuLaRoe business what I want! 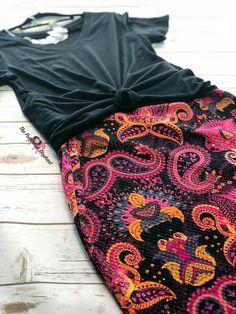 Whether you’re a LuLaRoe shopping pro or you’re new to the wonderful world of stylish and comfortable clothes, here’s a list of the ways you can shop my inventory at The Patterned Elephant. My most favorite way of showcasing my inventory is through an in home pop up! There’s just nothing like touching the fabrics, seeing the amazing prints in person, and trying on all the styles. I have a boutique in my home that currently houses over 900 pieces of LuLaRoe. Invite a few friends over and you have an instant party without the hassle of having to make your house “guest ready”. If you’d rather have a pop up at your home, or another location, that’s perfectly fine! I can load my car up and head to you. What if you live out of my area? No problem! We can schedule a Facebook Event and do an album sale (see below) right in my VIP group. It’s super easy to do, and I’ll guide you every step of the way. I have generous hostess benefits, so whether you opt for an in person or online pop up, you’re sure to earn some beautiful pieces. Contact me here for more information. Do you have a cause that is near and dear to your heart? Do you know someone who is facing tough times? A LuLaRoe fundraiser is a fun and easy way to raise money. For every piece sold during your fundraiser, I will donate $3, $2, or $1.50, depending on the particular style. (Don’t worry. 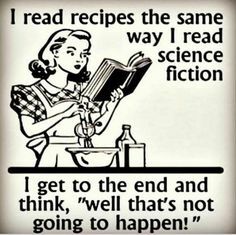 I’ll keep up with all of that on my end!) And better yet, once we hit $100–which is so easy to do–LuLaRoe will match the donation! And guess what? You still get the hostess benefits! What are you waiting for? Contact me here, and let’s make some money for your cause! My in home boutique is open for shopping whenever I’m home! Need a cute outfit for a last minute engagement? Check to see if I’m home and come on by! I can’t guarantee the state of my house, but I can guarantee you’ll find something you like! I also have set open hours every Friday and Saturday mornings from 9:00AM-noon. (Hours are subject to change.) So come on by and hang out with me! I’d love to get to know you, and I always have coffee! I currently run a weekly album sale in my VIP Facebook group here. I post my entire inventory to the albums section in my Facebook group at 8:00PM CT. The albums stay open to purchase from until 9:00PM CT Monday night. Again, within my Facebook group, I also do Live Sales. I typically do a Tuesday night Live Sale with my husband at 8:30PM CT, and I also do a Lunchtime Live on Thursdays at Noon CT. During the summer, these times vary, but during the school year, they run pretty regularly. Throughout the week I’ll also post some outfits or other pieces straight to my Facebook wall. It’s very informal, but I think it’s a fun way to showcase different pieces that sometimes get lost in the albums and live sales. I also enjoy taking requests from my customers, and wall drops are a great way to share the requests. One thing to know about my outfit sales–I will NEVER require that you purchase the entire outfit if you just want one item! However, outfits always ship for free and come with a surprise gift! 7. No Facebook? No problem! As you can see, I do a lot of my business on Facebook. I love my LuLaRoe Facebook community, but I understand if Facebook isn’t your thing. I use Shop the Roe, an online platform to help me list my inventory. While I don’t keep my inventory posted 24/7, I can provide a shopping link for you to use. Just send me a message, and I’ll be happy to send you the link. You can also find me on Instagram where I sometimes post items for sale. If you’re on Facebook, come join me! My group is more than a “selling” group, it’s a community, and I think it’s pretty cool! Oh my stars!! 😍 This Cassie Pencil Skirt (large) is fantastic!! The colors are so bright and fun, and the material is like a quilted fabric...so plush and soft! ☁️ And of course, everyone needs a solid black V-neck top (medium) in their closet! Head on over to my group to make it yours! 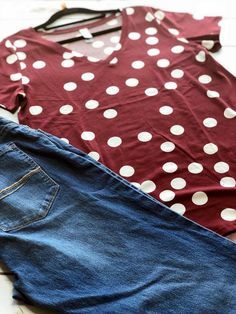 This Christy T V-neck shirt reminds me of fall football games. 🏈 And I just love all the dots! Small Christy T—if this one is for you, head over to my group to snag! 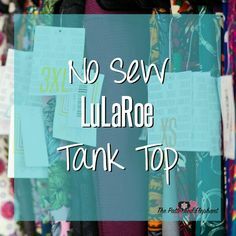 An easy way to upcyle your favorite LuLaRoe top into a tank top! No sewing required! yup. Just ask me to whip anything and then fold it in later. Nope.